In 2014, I attended the inaugural Rethinking Hell Conference, at which John Stackhouse Jr. gave an outrageously fine opening lecture (see more of the lectures at the Rethinking Hell youtube channel). But one of the breakouts that really affected me was a lecture by Anglican Ralph Bowles on Conditionalism and evangelism. This led me to the following incredible insights (to me, anyway) regarding the impact of our view of hell on evangelism. The current majority position on hell is ECT – which claims that the unrepentant burn forever, consciously suffering in hell. 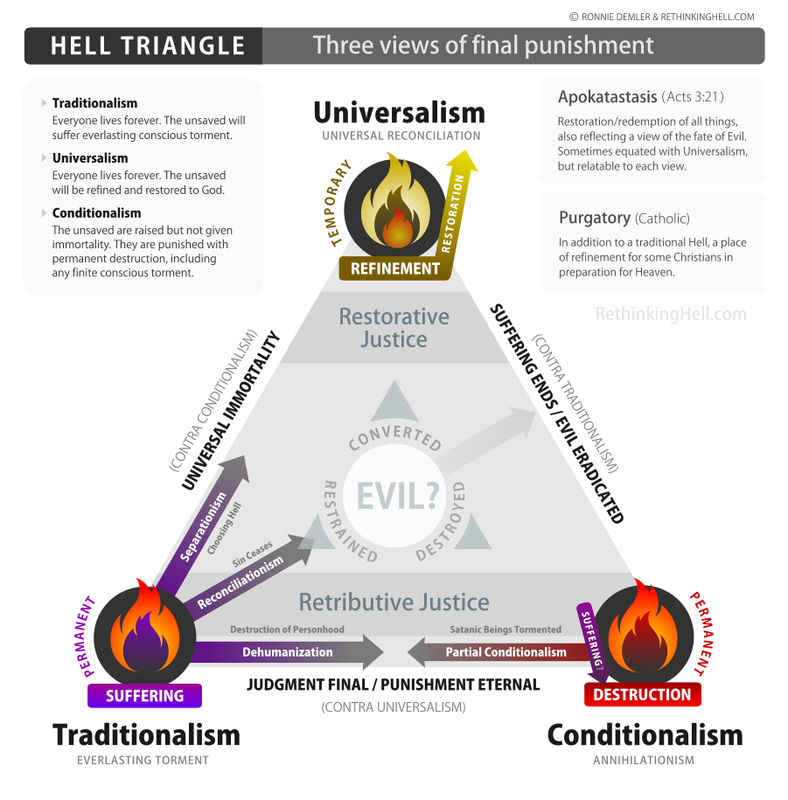 Proponents of this view chafe at Conditionalism, in part because they rightly perceive it as presenting a less severe punishment than their view, and suspect that this will lessen the comparative appeal of the gospel. I argue that ECT’s impact on evangelism is a net negative, perhaps significantly, when considering the literature as well as the moral climate of modern culture. One of the more profound conversations I had this week involved a man who confided in me that, though very evangelistic at heart, he had not wanted to share the gospel for years because of his lack of confidence in and shame over the doctrine of ECT. Even more surprisingly, when he shared his newfound confidence in Conditional Immortality (CI) with his wife, she told him that ECT was the reason that SHE had not wanted to share the gospel for years. This impediment to sharing the gospel should not be attributed to fear of the world or shame over the gospel, but rather, the active intuitions of Christians who rightly doubt the doctrine of ECT, which their own consciences indicate is unjust. Not only that, most, having not studied the actual relevant scriptures, have been sold on this doctrine based on authority and tradition, not scripture. In my experience, an open minded person who hears the Conditionalist exegesis and that critical of ECT for the first time is amazed that their intuitions may have been well grounded in scripture. This will be a short section. For those who support the ideas of Universal Reconciliation (UR), or even post-mortem repentance, the pressure to evangelize is nearly zero. Naturally, Universalists have the same impetus to share God’s love as both ECT and especially CI supporters, but the urgency in light of an eventual eternity with God can not be very high. And Ralph Bowles, who spoke at the Rethinking Hell Conference 2014, has had a lot of experience with this. He shared that, as an evangelical and leader in the very liberal Australian Anglican Church, where most of the leaders are Universalists, the prioritization and zeal for evangelism has become effectively nil due to the lack of any real consequence under the UR banner. There are many possible shifts in emphasis in our gospel presentation when we change from the ECT view to that of Conditionalism, but here are three profound shifts that I believe will have an incredible positive impact on evangelism. Almost every human moral and ethical code includes the idea that the punishment must fit the crime, and this law of proportionality is rightly perceived by many to be grossly violated by ECT. Conditionalism does not avoid the idea of giving an account to God, but proposes that the justice of God is finite and proportional to one’s deeds. While most humans probably underestimate the degree of their transgressions, they would admit that if God were just, we WOULD have to give an account, and in some fashion, it would be just to make us pay for our transgressions. In addition, the argument is easily buttressed by the concept that God can not leave the scales of justice undone in the case of those who never paid for their wrongs in this life. If God loves the victims of crime and hates injustice, surely he must bring some sort of reckoning to the unrepentant and selfish who harm others. Under Conditionalism, the idea of God as a just judge rightly matches the intuition of the sensible person who realized that justice involves a proportional response. Conditionalism confirms what most people already reason and intuit about justice. While many evangelicals preach the goodness of God (Romans 2:4), that alone can not be preached, because many must also be awakened from their hardness by the real threat of danger coming in the form of the day of reckoning before God. The Traditionalist emphasizes that the great terror to be avoided is an eternity in hell – that is, the avoidance of something negative. The Conditionalist, while not neglecting the reality of giving an account to God and receiving a finite, proportional penalty, will emphasize the potential loss of something GOOD – an eternity with God, and without pain, sorrow, or loss. An analogy that I like to use is that of a child that dies. We grieve the huge loss of their potential, and that they lived only a portion of their years. Now imagine that you are at the end of your short life, and you COULD have lived forever in a much more beautific universe, but instead, you are losing that future, and all you get is the short life you have spent. THIS is the tragic picture we must communicate to those who are outside. Strangely, our lifelong exposure to ECT may make this privation of eternal life seem not that horrible, but I believe that we must regain our sensitivity and perspective to the awful emotional and practial loss this represents, and communicate that effectively to those seeking to overcome death. Let’s face it – eternal hell, or eternal anything is hard to imagine. When we suggest such a thing, we are suggesting something for which there is no direct proof. And so people just don’t care much about it. But the fear of death, which is a verifiable reality, is a constant across humanity. If we are primarily offering a means to defeat death, we should have many ready listeners. Tragically, this central theme of the gospel is lost in the ECT view, which relegates death to a secondary consequence, or more exactly, redefines it as separation from God. But actual physical death, and actual physical resurrection ARE the central themes of the New Testament gospel, and the idea of overcoming death is the focus of a tremendous amount of human desire and ativity. And Conditionalism, abandoning the myopic focus on ECT, can now focus on, not only the day of judgement, but life eternal. 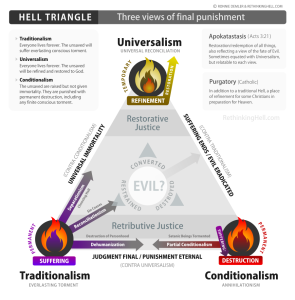 In summary, when we examine the three views of hell and their impact on evangelism, I would argue that Universalism obviates it, Traditionalism creates a huge stumbling block, but Conditionalism contributes hugely to evangelism by confirming people’s sense of proportional justice and fairness, appealing to the desirability of eternal life, and refocusing the gospel on overcoming death, a major concern of every human being. It may be hard to overstate the grave negative impact of the Traditional position on the reception of the gospel, as well as the tremendous positive impact that a Conditionalist understanding of hell would have on our presentation and the hearing of the gospel. May God convince us all of the importance of this issue.